Protesters outside the Supreme Court, which was hearing DAPA arguments, on April 18, 2016. The earliest, highest-profile critic of granting an executive reprieve to Dreamers was none other than Justice Antonin Scalia. The plight of young immigrants brought to the United States as children was not something the Supreme Court was concerned with in 2012, but the late justice somehow felt the need to protest, in open court, President Obama’s then weeks-old decision to not deport them for humanitarian reasons. “The president has said that the new program is, quote, the right thing to do, close quote, in light of Congress’ failure to pass the administration’s proposed revision of the immigration laws,” he said as he read from a summary of his partial dissent in Arizona v. United States. That case and decision had nothing to do with Dreamers. Maybe Scalia’s real qualm was with the sitting president and not the recipients of the Deferred Action for Childhood Arrivals program, better known as DACA. But his broader point, which a Supreme Court majority rejected, was that states should have leeway in enforcing federal immigration laws, since they — and not undocumented immigrants — face the “human realities” of a broken immigration system. The citizens of border states like Arizona “feel themselves under siege by large numbers of illegal immigrants who invade their property, strain their social services, and even place their lives in jeopardy,” Scalia complained. Somewhere, a future President Trump may have been taking notes. More than five years since that screed, the Supreme Court could soon get a chance to judge the propriety, if not the legality, of Trump’s decision last September to pull the plug on DACA. A federal judge in California in January ordered the reinstatement of the program, reasoning that its rescission rested on a “flawed legal premise” — namely, Jeff Sessions’s paper-thin conclusion that DACA was illegal the moment it was conceived. The judge also rejected as “spin” and “post-hoc rationalization” the Trump administration’s contention that DACA was vulnerable to a legal challenge by Texas and other states, which had threatened Sessions with a lawsuit if he didn’t kill the initiative outright. 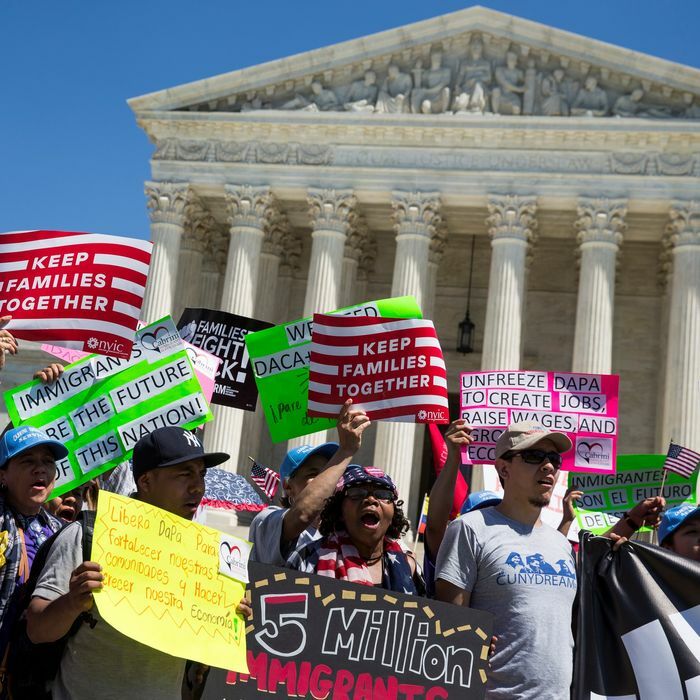 “The agency action was not in accordance with law because it was based on the flawed legal premise that the agency lacked authority to implement DACA,” wrote the judge, William Alsup, in a ruling that effectively brought DACA back from the dead. Days later, the administration began accepting renewal applications as if the rollback had never happened. Legal scholars weren’t impressed with the ruling. And Sessions, not one to give up on Trump’s anti-immigrant crusade, then took the “rare step” of appealing Alsup’s decision directly to the Supreme Court — and why not? The Ninth Circuit, Trump’s least favorite appeals court, is unruly, liberal, and anti-Trump, anyway; leapfrogging it seemed the smart thing to do. What’s more, Sessions wanted the justices to act expeditiously — his solicitor general filed an additional request to decide the case before the end of June. Not doing so, he suggested, would be the same as blessing “indefinitely an ongoing violation of federal law being committed by nearly 700,000 aliens.” So much for Trump’s wish to treat Dreamers “with heart.” There was only one problem: The Supreme Court rarely, if ever, lets anyone skip over the regular appeals process. And if Sessions is in such a hurry, why didn’t the administration seek to block Alsup’s ruling rather than comply with it? Last Friday, a coalition that includes the University of California, several states, a local chapter of the SEIU, and a number of Dreamers told the Supreme Court to reject the Trump administration’s request to hear the case. The DACA mess, this alliance broadly contended, is Trump’s and Congress’s to own, and the justices shouldn’t be the ones fixing it, at least not with the urgency Sessions is demanding. To make sense of all this legal tussling, I reached out to one of these DACA defenders, Janet Napolitano, the Department of Homeland Security secretary under Obama who drafted the original 2012 memorandum that gave birth to DACA. Back then, her agency faced its share of lawsuits over the program, but none got much farther than the courthouse door. “I’ve always felt that DACA was an entirely legal use of the Executive branch’s authority,” Napolitano, now the president of the University of California system, told New York. In her official capacity, she’s now one of several plaintiffs leading the charge on the West Coast to keep DACA alive in the courts for as long as possible — or at least until Trump and Congress reach an agreement on a permanent legislative fix for Dreamers. “The fact is that no court has found that DACA is illegal,” Napolitano added. Or unconstitutional, for that matter. Indeed, a parade of unlucky litigants tried to challenge DACA’s legality over the years, but all the cases were procedurally defective and got thrown out of court in the early stages. “We were very careful in creating DACA not to exceed the bounds of executive authority and grant permanent legal status when only Congress could do that,” Napolitano told me. Where the courts were less favorable was with a second Obama program, announced in 2014, that would’ve granted deferred action to the undocumented parents of U.S. citizens and permanent residents. That program never got off the ground because Texas and 25 other states secured a nationwide injunction against it. The Supreme Court, for its part, couldn’t do much about it: Scalia died while the case was pending and the remaining justices, split down the middle, left the injunction in place without a definitive ruling. Sessions cited this inconclusive affirmance, if one can call it that, for the proposition that DACA was at risk of being struck down by the courts. The principle of prosecutorial discretion, which is what holds DACA together, was never once discussed by Sessions when he announced the wind-down of DACA. He didn’t even try. Prosecutorial discretion wasn’t some novelty that Napolitano came up with at the time, let alone a quirk of immigration law. In a path-breaking memorandum written some 40 years ago, Sam Bernsen, the general counsel of the now-defunct Immigration and Naturalization Service, advised the agency’s commissioner that the “ultimate source for the exercise of prosecutorial discretion” lies with the inherent powers of the presidency. “Under Article II, Section 1 of the Constitution, the executive power is vested in the President,” Bernsen wrote in what is believed to be the first in a long string of government memos justifying prosecutorial discretion in the immigration realm. “Article II, Section 3, states that the President ‘shall take care that the laws be faithfully executed.’” Ironically, conservatives would later seize on this “take care” language to argue breathlessly that Obama’s immigration actions were an affront to the constitutional text, but no judge took that argument seriously. Far and wide, executive officers enjoy similar discretion to enforce the law. From the president down to a lowly street cop, every law enforcer, state or federal, exercises some form of prosecutorial discretion over the laws they’re entrusted to oversee. It’s the reason you don’t always get ticketed for jaywalking or pulled over for doing 65 on a 55, even in instances where you happen to do those things in full view of the police: The government has ample discretion to not go after you if it feels you’re a low-priority lawbreaker. Maybe the 75-miles-per-hour driver is the bigger fish. Whichever the case, the decision is, by and large, unchallengeable. “Federal officials, as an initial matter, must decide whether it makes sense to pursue removal at all,” wrote Justice Anthony Kennedy in the same immigration ruling that Scalia assailed in 2012. “Discretion in the enforcement of immigration law embraces immediate human concerns,” he added. In this climate, and with Trump still fielding immigration offers as Congress faces yet another deadline to fund the government, the Supreme Court would be crazy to jump into the DACA controversy. “I think for the Supreme Court to reach down to a district court decision and not allow the normal appellate process to proceed would necessarily, under the circumstances, involve or indicate that the Supreme Court is signaling its involvement in a deeply political matter,” Napolitano told me. Scalia may have felt comfortable criticizing policy choices from the bench, but that doesn’t mean Chief Justice John Roberts and his colleagues have to take the bait. For their own peace of mind and that of Dreamers, the Court is better off staying as far away as possible, and letting Trump take care of the laws that give him broad authority to spare young undocumented immigrants if he really wants to.